In the market for a new snowboard? One that will give you tip-to-tail stability when making high-speed carves on hardpack? And one that shines as brightly as you? Sounds like you're in the market for the Roxy Radiance C2 BTX Snowboard. The predictability of this board comes from the C2 Magne-Traction™ combination. Rocker between the bindings intersects camber at the ends to give you tons of preloaded-pop and precision in the park, or in the pow. Magne Traction™ gives you grip when you need it (on ice) but backs off when the snow is soft. 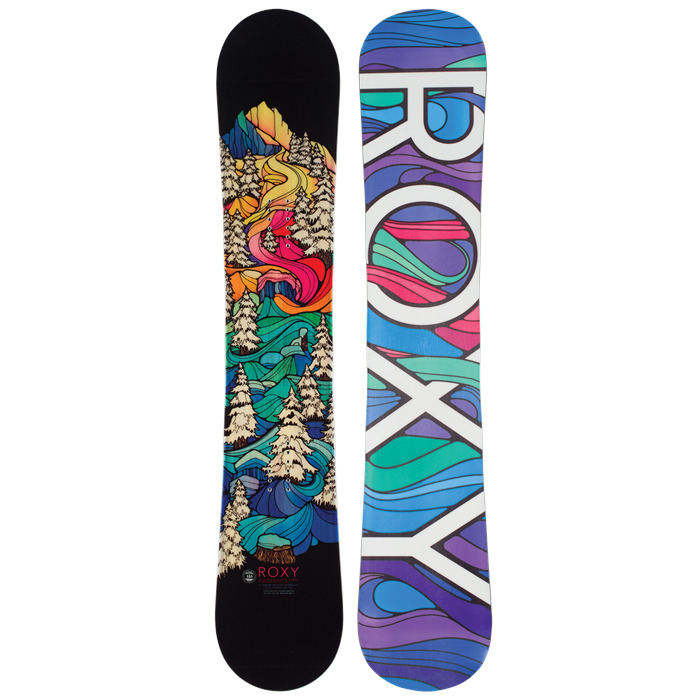 Stay catch free and radiate confidence on the Roxy Radiance C2 BTX Snowboard. C2 BTX  Patented C2 Banana Traction is a blend of rocker between the bindings and camber at the tip and tail. C2 is for strong riders looking to take their riding to the next level. Get ready for a poppy, smooth ride that gives you the confidence to take anywhere. Flex Rating: 4 (1 Soft - 10 Stiff)  A mild flex rating is great for progression at all levels. Forgiving in the park and playful in the powder. Even at high speeds this board will give you a predictable and precise feeling. Full Heart Core  Loaded with life, Roxy's Full Heart core is lightweight and environmentally better! Made from fast-growing, sustainable, strong timbers. Silky Smooth  Lighter than fiberglass, this renewable organic fiber has inherent vibration dampening properties. Silky Smooth has more elasticity compared to other fibers used in snowboard construction. 5 SW  UHMW (Ultra High Molecular Weight) sidewalls made from a soy-based elastomer. Laminated with five internal layers of wood to create a durable sidewall. TNT  Roxy's secret formula dual-layered fluoro base materials. TNT is super-fast and durable. Magne-Traction™  Strategically located serrations on your edges that create confidence building, fatigue-reducing edge hold all over the mountain especially on hard pack and ice. Clear Bio Plastic Bean  This is an earth-friendly, bio-plastic top skin made from beans. The clear skin lets you see through to the core of your board. This topsheet features the highest strength-to-weight ratio and dampens for an unbeatable ride.